LOS ANGELES, Ca. - Tewa Kiram has fought 38 times as a professional boxer, winning every bout, 28 by knockout. But he has yet to compete outside his native Thailand; Saturday night at The Forum at Inglewood (HBO, 10:30 PM ET/PT) will be his first chance to show what he can do on the world stage. For Mercito Gesta, it will be his second attempt to prove he belongs at an elite level. His first effort at claiming a world title came up short in a forgettable challenge of then-lightweight titleist Miguel Vasquez in 2012. The Filipino is unbeaten since then and on Saturday will be looking to go one better and claim a title belt. He will do so by challenging Jorge Linares, who is arguably in the third stage of his own career, a stage that has been perhaps the most impressive thus far. A highly touted youngster, the Venezuelan was 27-0 and holder of a super featherweight belt when he suffered his first, upset, loss in 2009; he rebounded with four wins before, almost two years to the day since his first defeat, he experienced another – and then, in his very next outing, a third. He appeared finished as a serious contender, his chances of future success all but written off. Since then, however, he has won 12 straight fights to re-establish himself as one of the top fighters in his division. How many lives has Lucas Matthysse, Kiram’s opponent, had? That’s a little more difficult to answer. Although he was undefeated when he dropped a points decision to Zab Judah in 2010, he was unheralded; and besides, there were plenty of observers who thought he deserved the verdict against the more celebrated Judah – as well as the split decision he dropped against Devon Alexander two fights later. But then Matthysse embarked on a stretch of increasing dominance, culminating in a one-sided battering of Lamont Peterson in 2013. Let’s call that Stage Two. That set up a showdown with rival Danny Garcia, which Matthysse was widely expected to win, but which, after a strong start, he lost. From there, he engaged in a series of hellish battles, which he won – until he didn’t, Viktor Postol putting him down and out in 2015. After nineteen months to recover and recharge, Matthysse is back and entering the fourth chapter of his boxing biography. Linares and Matthysse — the veterans, the known quantities — are the favorites in their respective contests; and yet, because they have experienced downs as well as ups, far more so than Gesta and Kiram, because more is expected of them but because more chances have been taken by them, arguably more is at stake for them than for their opponents. Kiram and Gesta both yearn for success on Saturday night. Victory would enable them to take a leap up to another level, to prove to skeptics that they are indeed as good as advertised, to earn much more money in pursuit of even greater glory. But defeat need not be a disaster: undesirable, yes; soul-crushingly disappointing, certainly. But each would likely continue along the path he has already to this point been following; it is not beyond reason that either could receive another call to the major leagues. For Matthysse and Linares, however, it would be another matter. Boxing celebrates success but never entirely forgets the stigma of failure, which follows around those who have experienced it like a stubborn stench. 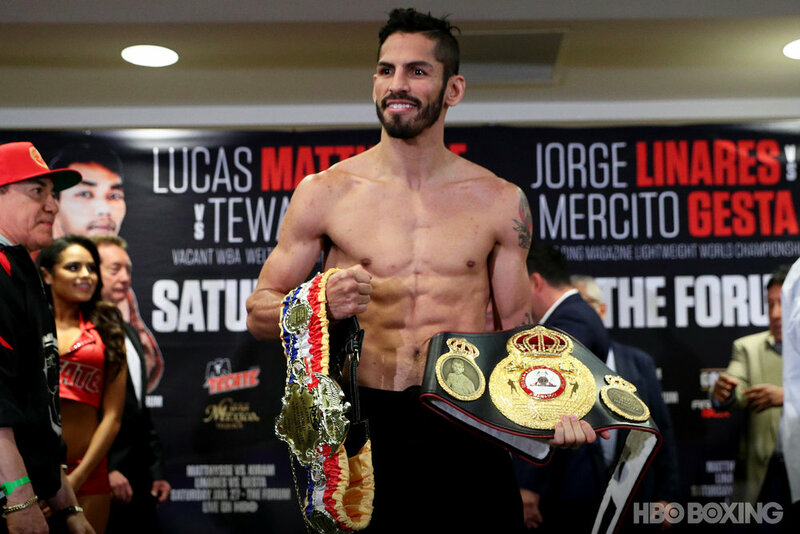 Linares and Matthysse have proven plenty, achieved more than enough for their careers to be rightly lauded as successes of the type to which many boxers can only aspire. But they have had their second chances, and their third; they know that while the same opportunities await them as their opponents in the wake of victory, defeat would be an altogether more punishing a proposition, relegating them to the second tier – a level from which, this time, an opportunity to escape, rebuild, and return to glory would likely be far less elusive. For all four men, Saturday’s fights are contests in search of further glory. For Matthysse and Linares, they are battles for continued survival.